Number nine embodies the qualities of completing a cycle, experiencing life from an objective intuitive mind, encompassing tolerance and universal love for all, exercising universal service, having compassion for humanity, regenerating and/or transforming one's consciousness, and sharing one's wisdom with the world. Number nine sets herself mathematically apart from other natural numbers of the decimal system in a very unique way. For example, when multiplying any number by 9, and reducing the result thereof to a single digit number will result in number 9. The number 9 simply takes over. Also, the periodic table consists of 18 groups, and 1+8=9. The chemical element that correlates with number nine is the non-metallic element fluorine, a pale yellow, corrosive gas, which reacts with practically all organic and inorganic substances. It is essentially only found in compounds because it is the most electronegative and reactive of all elements. Its reactions with other substances are often sudden or explosive. Many generally non-reactive substances such as finely divided metals, glass, ceramics, carbon are readily consumed by cold fluorine gas, and wood and even water burn with a bright flame when subjected to a rapid stream of fluorine. Elemental fluorine and the fluoride ion (in quantity) are highly toxic. Fluorine belongs to the halogen group, and is the lightest member. 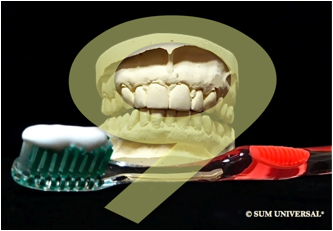 The commercial use of fluorine compounds is manifold whereby sodium fluoride is the most known fluorine compound, which is added to toothpastes to prevent dental cavities. Trace amounts of fluorine are found in our body as fluoride, a negative ion. Only a couple grams of fluoride are found, of which around 95 percent are in our teeth and bones. Fluoride is primarily needed to build healthy teeth by increasing the density of the mineral crystals that form our teeth. It actually helps to prevent tooth decay by making the tooth more resistant to acid attacks from plaque bacteria and sugars in the mouth. The process of increasing the density applies to our bones as well. Since only trace amounts of fluoride are needed, the intake of too much fluoride will damage teeth and bones. And excessive consummation of fluoride is toxic to the body.